I have always wanted to try chorizo, so a few weeks ago I decided to do just that. I put together this little one skillet meal. It was so easy and came together really quickly. Both my husband and I really liked it. The chorizo was a little more fatty than I had expected, but I just drained off the fat, like I would bacon. 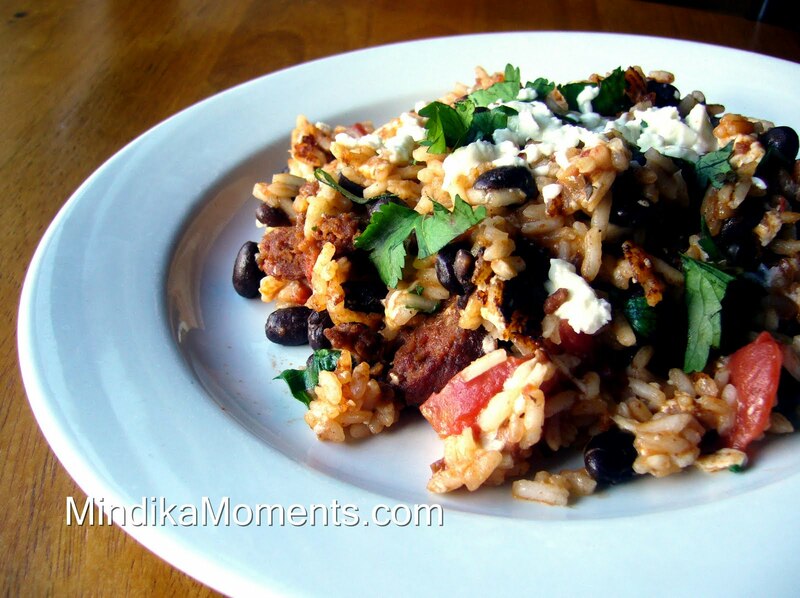 We loved the smoky flavor of the dish and the creaminess of the Queso Fresco. It was definitely a success! 1. In a large skilled sauté the chorizo until all the fat has been rendered. Once the chorizo has been cooked, drain off all the fat. 2. Return the chorizo to the skillet. Add the rice, beans and tomatoes, stirring to combine. Season with salt & pepper to taste. 3. When everything is nice and hot, stir in the cheese and cilantro. Continue to cook until the cheese melts, about 3-4 minutes. It won’t melt like regular cheese. Queso Fresco melts more like a fresh mozzarella. It will just get nice and soft. 4. Serve immediately. If you like, top with some additional fresh cilantro and crumbled cheese. Oh the aroma of chorizo is coming back to me as I read this post. I am missing home now! As a kid I guess you never knew about how fat some of these foods could be. :) Glad you could try it. I'll have to try this recipe. My hubby and I here and there like to eat chorizo. Thanks for sharing.